DOWNEND Cricket Club is continuing to be recognised for its outstanding work with young people. The club's All Stars Activators, Thom Manning and Rob Ayerst, picked up a national award at a prestigious ceremony held at Lord's Cricket Ground on October 9. Fresh from receiving the Gloucestershire Coach of the Year award, Thom has organised, and both have run, the All Stars Cricket Centre for five to eight-year-olds for the last two years at the local club. This year, the pair added a further two Activators, Spencer Halliday and Paul Freeman, recruited from parents of children on the programme. 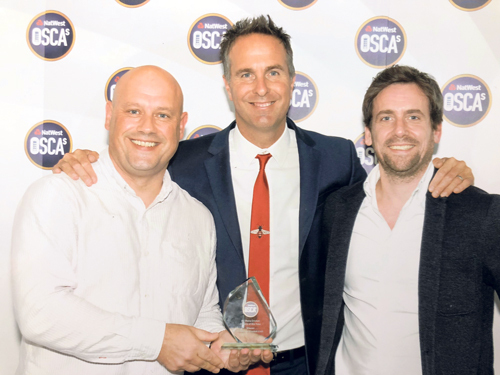 Thom and Rob picked up the Natwest sponsored Outstanding Service to Cricket Award (OSCA) for Downend Cricket Club, beating more than 2,000 centres to be named the All Stars Centre of the Year for 2018. The award recognises the innovative training and volunteering opportunity offered to the club's youth players who, as assistant coaches, helped manage and train the 90 children in the club's programme. Thom and Rob were presented with the award by Michael Vaughan, the ex-England captain, in front of more than 300 volunteers, cricket professionals and ECB board members at the ceremony. Thom said: "It’s been quite a year! With All Stars we just wanted to make sure 2018 was even better organised and more structured each week than we managed last year, and it made perfect sense to formalise the involvement of our youth players with their first coaching qualification and a volunteering experience they can use in future job and university applications. "To be recognised for this initiative, and have the national All Stars Team consider its development within the national programme is very rewarding." Rob said: "To be recognised over and above 2,000 other centres across England and Wales makes us all feel very proud. The feedback locally from parents has also been very positive, but we’re not taking anything for granted. The All Stars Programme stands and falls on our volunteers and we are already planning improvements for 2019."